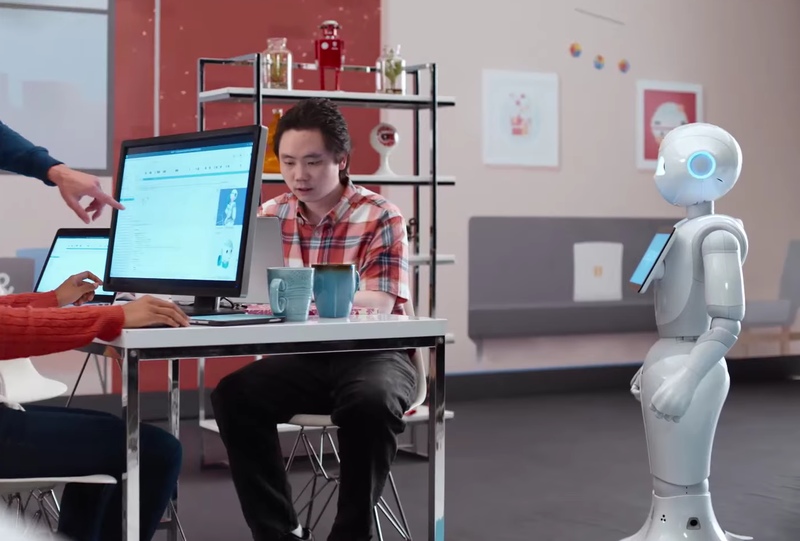 Pepper is a model of humanoid robots developed by French company Aldebaran Robotics and Japan's SoftBank Mobile. The product debuted in 2014, launched in Japan the following year, and has since entered the EU. Now these robots are making their way over to the US. SoftBank is opening its North American headquarters in San Francisco. In the process, SoftBank is opening a new developer portal. It's also providing an Android SDK. This will enable programmers to manipulate the robot's movements and provide content for the tablet that comprises the robot's chest. Pepper isn't a product meant for the home. Instead, the creators pitch Pepper as a robot designed to make people happy, facilitate relationships, and enhance lives. Developers will have the option to buy models starting in July of this year, but the beta version of the "Pepper SDK for Android Studio" is available now. Mountain View, Calif., May 18, 2016 – SoftBank Robotics America (SBRA), the newly established North American headquarters of SoftBank Robotics Holdings, today invites developers into its new global Developer Portal, to gain access to the next level of interactive high-tech: Pepper, the humanoid robot. Coupling Pepper’s emotion-recognition AI with their own custom, coded creations, developers now have the opportunity to take part in the pioneering of this next generation computational platform while literally bringing their ideas to life. Launching alongside the Developer Portal, developers can also download the Beta version of the Pepper SDK for Android Studio to access the tools and training to create new content and usages for Pepper. Offering multiple SDK options, support and dedicated training, as well as access to an ever-growing global community, developers can build custom applications for this one-of-a-kind platform, exploring the near limitless potential that Pepper offers for businesses and their customers. SBRA-led workshops and trainings will be organized through the Developer Portal and users can directly access documentation, software and other resources to help bring Pepper to life. Through open, collaborative forums on the portal, developers can connect directly with SBRA engineers and a smart, vibrant community of robotics programmers all working toward further advancing Pepper’s abilities. The combination of multiple SDK options, including the new Pepper SDK for Android Studio and Robot APIs within each SDK, will allow developers to create new, practical applications for Pepper even on a PC virtual environment. In anticipation of Pepper’s U.S. debut, Pepper now supports Google’s Android OS and Google Mobile Services. Additionally, an SDK has been released allowing for Android Studio to support Pepper-specific APIs to enhance the developer experience. Developers attending Google I/O can learn more about the Pepper SDK for Android Studio and the API’s from Laurent Lec, Software Director for SoftBank Robotics. During a 45-minute session on May 19, Lec will explore the capabilities, practicalities and opportunities of the exciting new development landscape that Pepper brings by offering real time examples that illustrate the breadth of Pepper’s functionality and potential. Details on Lec’s session can be found here. Now headquartered in San Francisco, California, SoftBank Robotics America is a subsidiary of SoftBank Robotics Holdings based in Japan. As SBRA prepares to bring Pepper to the U.S. marketplace, the company will remain dedicated to the original mission and goals of those who created Pepper by continuing the legacy of research and robotic leadership of SoftBank Robotics Holdings Corporation.